Sat., May 5, 2018, 11:14 p.m. The San Diego Padres rebounded nicely from Los Angeles’ combined no-hitter, using two-run homers by Eric Hosmer and Raffy Lopez to beat the Dodgers 7-4 on Saturday night in Monterrey, Mexico, in the first major league series in Mexico since 1999. 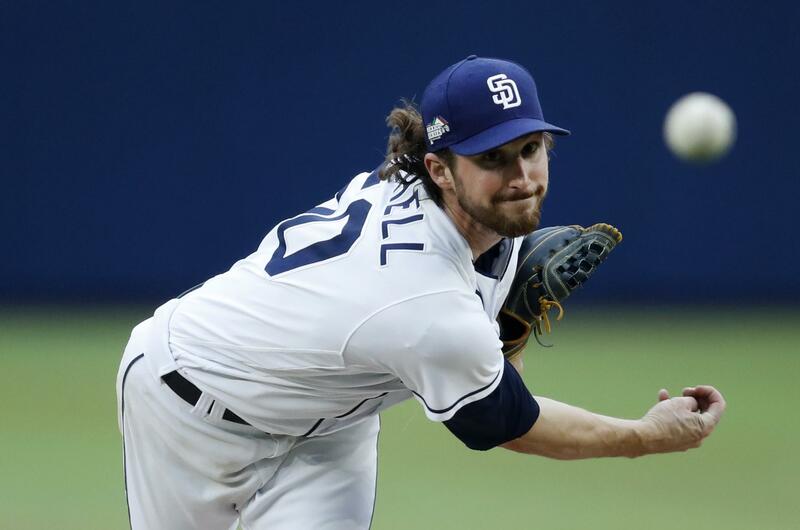 A day after the first no-hitter outside the U.S. or Canada, Travis Jankowski led off the first with a triple for San Diego’s first hit of the series. Hosmer then hit a drive over the wall in right against Kenta Maeda. Lopez’s first homer of the season erased a 4-3 Los Angeles lead in the sixth, and Chase Headley and Carlos Asuaje contributed RBI singles in the eighth against Daniel Hudson. Kirby Yates got two outs for the win, and Brad Hand worked the ninth for his eighth save. Josh Fields (2-1) allowed Lopez’s homer. On Friday night, Walker Buehler and three relievers posted the 12th combined no-hitter in major league history, leading the Dodgers to a 4-0 victory. Mariners 9, Angels 8 (11): Ryon Healy scored Kyle Seager in the 11th inning with a single just fair down the left-field line and Seattle rallied twice in extra innings to beat visiting Los Angeles. The Angels took the lead in the 11th when Andrelton Simmons was safe on an infield single off Eric Goeddel (1-0) with two outs, allowing Mike Trout to score – the second straight inning the Angels took the lead with two outs. Seattle answered immediately both times. In the 11th, Seattle got a run off Jim Johnson (2-1) before Healy turned on an 0-1 pitch from Eduardo Paredes. Zack Cozart made a diving attempt, but the ball ricocheted off his glove, and Seager scored with ease. Yankees 5, Indians 2: Indians shortstop Francisco Lindor’s double error led to a pair of runs in a four-run fifth inning off previously unhittable Trevor Bauer, and the Yankees won for the 14th time in 15 games, defeating Cleveland in New York. New York is in its first 14-1 stretch since 1998 Yankees won 114 games during the regular season and then the first of three straight World Series titles. Sonny Gray (2-2) allowed two runs in six innings in his first win since April 7. David Robertson worked the ninth for his first save. Lindor put the Indians ahead in the fifth with his fourth homer in five games, but he has made three errors in the past two games. Bauer (2-3) pitched six innings of two-hit ball. He was charged with four runs, two earned. Red Sox 6, Rangers 5: Craig Kimbrel became the quickest pitcher to reach 300 career saves, closing out Boston’s win after the Red Sox scored the go-ahead run in the top of the ninth inning in Arlington, Texas. Kimbrel worked a perfect ninth for his ninth save this season. His 300th save overall came in his 494th career appearance and 330th save opportunity, and just less than three weeks before his 30th birthday. Andrew Benintendi hit a triple off the right-center wall in the ninth against Keone Kela (2-2) and scored on a sacrifice fly by Hanley Ramirez. Cardinals 8, Cubs 6 (10): Kolten Wong hit a two-run homer in the 10th inning, lifting St. Louis to its fourth straight victory, defeating Chicago in St. Louis. The Cardinals trailed 6-4 before Marcell Ozuna hit a two-run double off Brandon Morrow in the ninth, handing the closer his first blown save of the season. Paul DeJong led off the 10th with a walk and Wong followed with a drive to right against Luke Farrell (1-1). It was Wong’s third career game-ending homer. Tyler Lyons (1-0) earned the win after Bud Norris exited in the top of the 10th inning due to tightness in his triceps. Anthony Rizzo and Javier Baez homered for the Cubs, who lost for a season-high fourth time in a row despite scoring more than three runs for the first time since April 24th. Astros 4, Diamondbacks 3: A.J. Pollock singled off the glove of third baseman Alex Bregman with the bases loaded in the ninth inning, lifting Arizona over Houston in Phoenix. Pollock delivered off reliever Brad Peacock on the first pitch after Chris Devenski (1-1) had walked the previous two hitters to load the bases. Brad Boxberger (1-2) got the win in relief. Athletics 2, Orioles 0 (12): Khris Davis homered in the 12th inning, lifting the Athletics to the win over visiting Baltimore at Oakland, California. Jed Lowrie singled with one out before Davis drove a 3-1 fastball from Pedro Araujo (1-3) into the bleachers in left. It was Davis’ third career game-ending homer. Chris Hatcher (3-0) got two outs for the win, finishing the A’s seven-hitter. Trevor Cahill got the start and struck out 12 while pitching six innings of four-hit ball. Baltimore wasted a terrific performance by Kevin Gausman in its fifth straight loss. Gausman pitched nine innings of two-hit ball. Phillies 3, Nationals 1: Rhys Hoskins hit a two-run homer, Vince Velasquez pitched five effective innings and Philadelphia snapped Washington’s six-game win streak, defeating the Nationals in Washington. Velasquez (2-4) allowed one run and one hit in his first win since April 7. Hector Neris worked the ninth for his sixth save. Wilmer Difo homered for Washington. Third baseman Anthony Rendon went 0 for 2 with two walks after missing 19 games with what the team called a contusion to his toe. Nationals right-hander Tanner Roark (2-3) tied his season high with nine strikeouts in 6 1/3 innings. He was charged with three runs and six hits. Tigers 3, Royals 2: Jordan Zimmermann pitched five scoreless innings and Nicholas Castellanos had three extra-base hits, leading Detroit to the win in Kansas City, Missouri. Zimmermann (2-0) improved to 4-0 with a 1.48 ERA in seven appearances against the Royals. Shane Greene allowed an unearned run in the ninth before striking out Alcides Escobar and Jon Jay for his sixth save. Castellanos had an RBI double as the Tigers scored three runs in the first inning off Jason Hammel (0-4). Kansas City’s Jorge Soler went 0 for 4, snapping his career-high 19-game on-base streak and 10-game hitting streak. Rockies 2, Mets 0: Chad Bettis pitched seven smooth innings, Nolan Arenado homered early off the big apple at Citi Field, and the visiting Rockies shut down the slumping Mets. Pinch hitter David Dahl gave the Rockies an insurance run with a two-out RBI single off Robert Gsellman in the ninth, though left fielder Yoenis Cespedes threw out a runner at the plate on the play. Adam Ottavino and Wade Davis finished a six-hitter that took just under 2 1/2 hours, sealing Colorado’s fourth straight win. Despite a solid start by Steven Matz (1-3), the staggering Mets fell to 0-5 on their six-game homestand. Bettis (4-1) allowed six hits. Davis got his 13th save in 14 chances. Brewers 5, Pirates 3: Ryan Braun hit a tiebreaking two-run double in the eighth inning, helping Milwaukee to the home win. Braun, who entered as a pinch hitter in the seventh, drove a pitch from George Kontos (2-3) to the center-field wall to score Domingo Santana and Eric Sogard. Braun got a chance to bat after Kontos walked Sogard, batting .105, on four pitches. Josh Hader (1-0) pitched the final two innings to pick up the win. He surrendered Starling Marte’s tying two-run homer in the top of the eighth, and then retired the Pirates in order in the ninth. Giants 11, Braves 2: Buster Posey and Andrew McCutchen each had three of San Francisco’s 18 hits, leading the Giants to their third straight victory, defeating the Braves in Atlanta. Alen Hanson homered and drove in four runs, Gorkys Hernandez had four hits and Brandon Crawford had three hits and two RBIs for the Giants. Ty Blach (3-3) gave up only one earned run in 7 2/3 innings. Hanson’s second-inning double to center field drove in Brandon Belt and Crawford. Hanson pulled a pitch down the right-field line for a two-run homer in the third. Atlanta’s Brandon McCarthy (4-1) gave up eight runs and 12 hits in only 3 1/3 innings. Marlins 6, Reds 0: Starlin Castro drove in three runs with a homer and a double, backing another strong performance by Caleb Smith as Miami defeated the Reds in Cincinnati. Smith (2-3) has been stingy in his last three starts, allowing only two runs and seven hits in 18 2/3 innings with 26 strikeouts. Against the Reds, he gave up three hits and fanned seven in 5 2/3 innings, escaping threats created by a couple of Marlins errors. Three relievers completed a four-hitter. Miami’s struggling offense got the early lead as Castro and Justin Bour homered off rookie Tyler Mahle (2-4). Rays 5, Blue Jays 3: Denard Span drove in his team-leading 24th run to help surging Tampa Bay beat Toronto in St. Petersburg, Florida. The Rays chased Aaron Sanchez (2-3) in the fourth, taking a 4-1 lead on Span’s single and a sacrifice fly by Matt Duffy. Span’s 24 RBIs have come in 90 at-bats. Jake Faria (3-1) allowed a run and three hits in 5 1/3 innings as the Rays got their 11th victory in 14 games to improve to 15-16. Alex Colome got five outs for his sixth save. Teoscar Hernandez and Lourdes Gurriel Jr. homered for the Blue Jays, who have lost eight of 12. Twins 8, White Sox 4: Eddie Rosario homered and drove in five runs, Lance Lynn earned his first A.L. win, and visiting Minnesota posted back-to-back victories from the first time since April 12. Rosario had four hits, including a two-run homer in the third inning and a two-run double in the fourth. Minnesota tagged Hector Santiago (0-1) for eight runs in 3 1/3 innings. Tim Anderson homered twice for Chicago, which has lost six of seven. Lynn (1-3) allowed two runs in six innings. He struck out seven without a walk and left his sixth start for the Twins with a 7.28 ERA. Published: May 5, 2018, 11:14 p.m.